In 2018, Ipswich-based business electricity supplier Haven Power reduced its carbon emissions significantly, compared to 2017, as part of a wider sustainability improvement programme. The savings were made through a variety of sustainability initiatives, including using renewable energy from Drax. Haven Power has continued its sustainability efforts in 2019 by installing almost 500m² of solar panels and replacing inefficient lighting with light-emitting diodes (LEDs). The company’s also fitted electric vehicle (EV) charging points for staff and visitors to use, and has a BMW i3 electric pool car that colleagues call Evie. 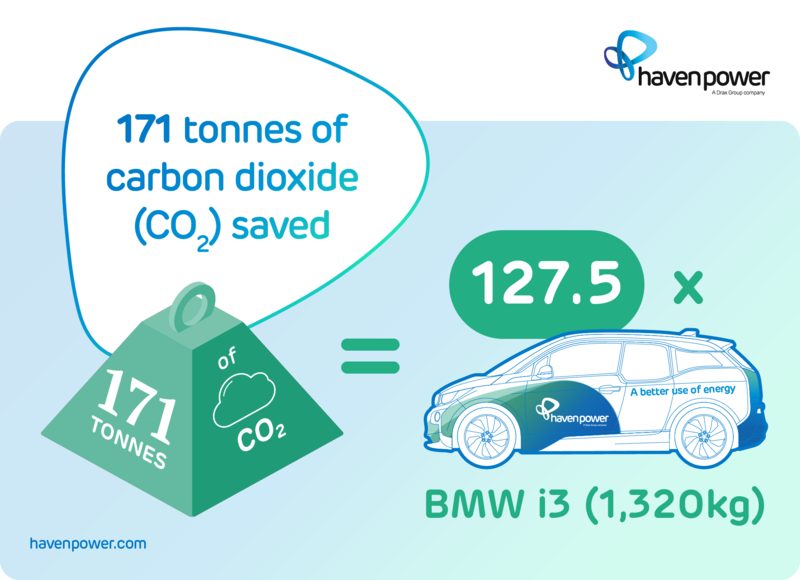 The 171 tonnes of carbon dioxide (CO₂) saved over the course of 2017-18 are equivalent to the weight of 127.5 Evies*. The size of the saving means the supplier is closer to achieving the vision of parent company, Drax Group: to enable a zero carbon, lower cost energy future. Colchester Hospital is just one of the many organisations that Haven Power has helped to reduce energy consumption, costs and carbon footprint.